Blastomycosis is a systemic mycosis caused by the thermally dimorphic fungus Blastomyces dermatitidis. The organism, the asexual stage of Ajellomyces dermatitidis, grows as a conidia-producing mycelial form at 25–30 °C which transitions to large budding yeast at 37 °C. Recent molecular studies indicate that B. dermatitidis consists of two major genetically divergent groups within endemic geographic regions. Given the infrequency of environmental isolation, human cases of blastomycosis have been utilized for endemicity mapping. These cases indicate that the Mississippi and Ohio River valleys are of high prevalence. Blastomycosis primarily manifests as a pulmonary infection although hematogenous spread of the yeast can cause extrapulmonary disease involving skin and bone as well as the genitourinary and the central nervous systems (CNS). Definitive diagnosis is based on culture of B. dermatitidis from appropriate clinical and histopathologic specimens from affected systems. Organism identification via traditional culture techniques may take up to 3 weeks, and culture-based DNA tests may be used to improve time to diagnosis. Serologic tests for blastomycosis are of limited usefulness. Antigen detection in the urine and serum serves as an important, but imperfect, surrogate to culture techniques and may aid in the diagnosis and management of blastomycosis. 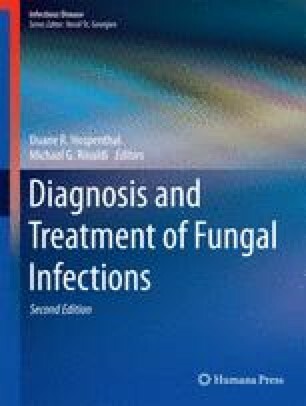 Treatment of blastomycosis is based on the clinical presentation and severity of disease, the immune status of the patient, and the toxicity of the antifungal agents. Although associated with significant toxicity, lipid-based amphotericin B is preferred for the treatment of life-threatening disease, including patients who are immunocompromised or those with CNS disease. Once stabilized, patients may be switched to itraconazole, the treatment of choice for mild-to-moderate non-CNS disease. Treatment duration generally exceeds 6–12 months.